Flying a slightly modified Lockheed F-104C-5-LO Starfighter, 56-885, (the aft fuselage had been replaced by one from a two-place F-104B, which had larger tail surfaces), Jordan released the brakes at Edwards Air Force Base, and 15 minutes, 4.92 seconds later he reached 30,000 meters (98,425 feet) establishing an Fédération Aéronautique Internationale (FAI) world record for time-to-altitude.² The Starfighter continued the zoom climb profile, peaking at 103,389 feet (31,513 meters) ³ and going over the top at 455 knots (843 kilometers per hour). While accelerating for the zoom maneuver, Jordan’s F-104 reached Mach 2.36. Fédération Aéronautique Internationale rules required that a new record must exceed the previous record by 3%. The Starfighter beat the Phantom II’s peak altitude by 4.95%. Captain Jordan was credited for his very precise flying and energy efficiency. 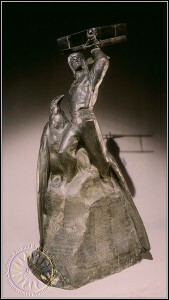 For this flight, Captain Jordan was awarded the Harmon International Trophy. Joe Bailey Jordan was born at Huntsville, Texas, 12 June 1929, the son of James Broughtan Jordan, a track foreman, and Mattie Lee Simms Jordan. He entered the Air Force in 1949, trained as a pilot and received his pilot’s wings 15 September 1950. He flew the Lockheed F-80 Shooting Star during the Korean War, and served as a flight instructor after his return to the United States. 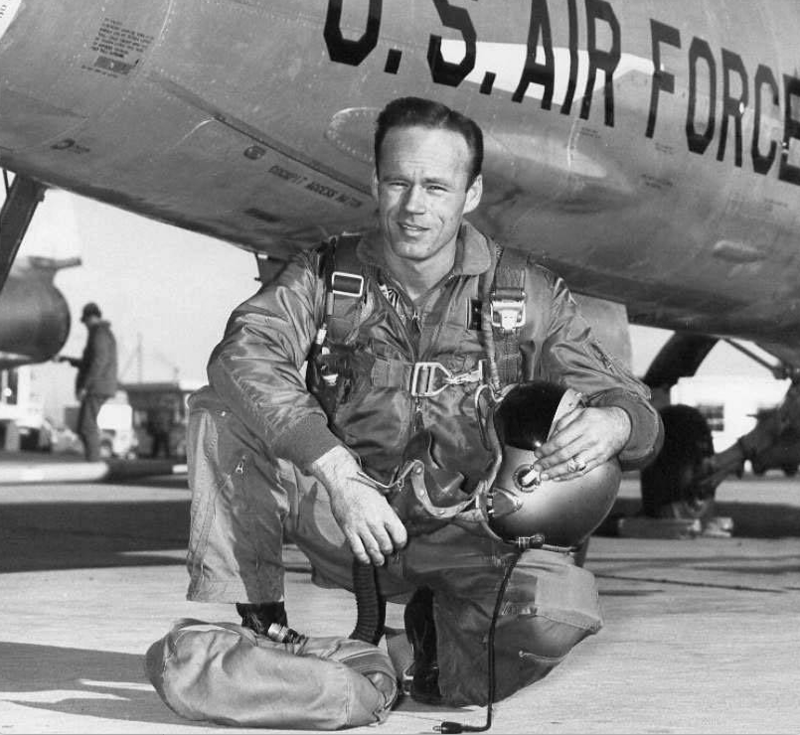 He was a graduate of both the Air Force Test Pilot School and the Air Force Fighter Weapons School. He became a project test pilot on the F-104 in 1956. Jordan married Dolores Ann Craig of Spokane, Washington, 8 February 1958, at Santa Monica, California. They had two children, Carrie and Ken. 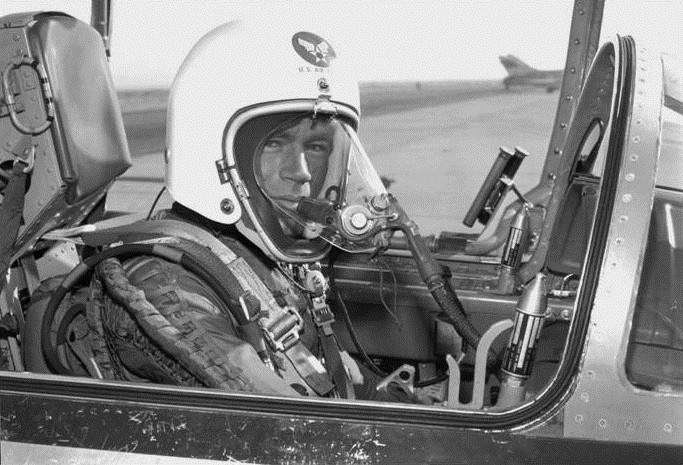 Colonel Jordan was the first Western pilot to fly the Mikoyan-Gurevich MiG-21 interceptor and his evaluations allowed U.S. pilots to exploit the MiG’s weaknesses during the Vietnam War. While testing General Dynamics F-111A 65-5701, Jordan and his co-pilot were forced to eject in the fighter’s escape capsule when the aircraft caught fire during a gunnery exercise at Edwards AFB, 2 January 1968. His back was injured in the ejection. 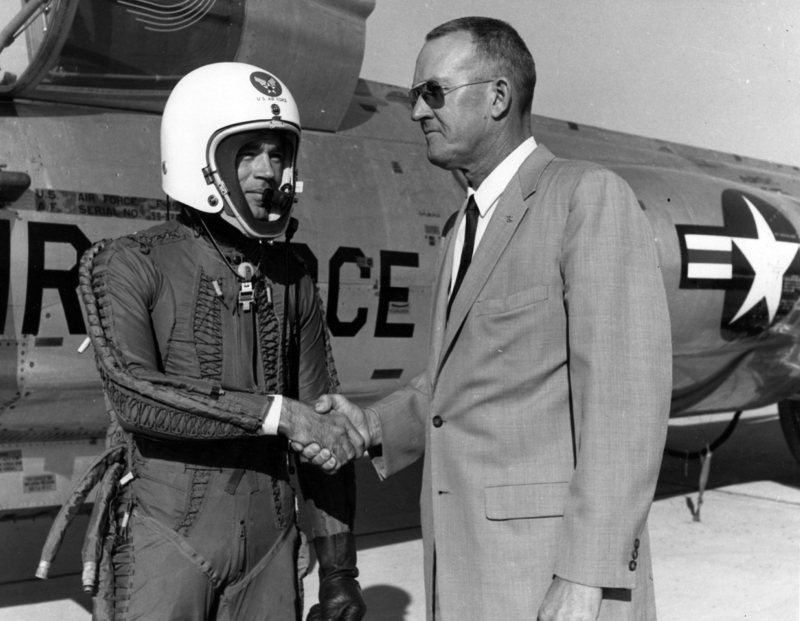 After Jordan retired from the Air Force in 1972, he became an engineering test pilot for the Northrop Corporation’s YF-17 flight test program. Lieutenant Colonel Joe Bailey Jordan died at Oceanside, California, 22 April 1990, at the age of 60 years. His ashes were spread at Edwards Air Force Base. Jordan Street on the air base is named in his honor. The Lockheed F-104C Starfighter was a tactical strike variant of the F-104A interceptor. The F-104C shared the external dimensions of the F-104A, but weighed slightly less. The F-104C was powered by a single General Electric J79-GE-7 engine, a single-spool axial-flow afterburning turbojet, which used a 17-stage compressor and 3-stage turbine. The J79-GE-7 is rated at 10,000 pounds of thrust (44.482 kilonewtons), and 15,800 pounds (70.282 kilonewtons) with afterburner. The engine is 17 feet, 4 inches (5.283 meters) long, 3 feet, 2.3 inches (0.973 meters) in diameter, and weighs 3,575 pounds (1,622 kilograms). The F-104C could carry a 2,000 pound weapon on a centerline hardpoint. It could carry up to four AIM-9B Sidewinder missiles. On 9 May 1961, near Moron AFB, Spain, Starfighter 56-885 had a flight control failure with stick moving full aft. The pilot was unable to move it forward, resulting in an initial zoom climb followed by unrecoverable tumble. The pilot safely ejected but the airplane crashed and was destroyed.